100% Viognier, we believe this excellent grape represents a wine for the future which is not yet very well known in Sicily. The wine shows the skills of the Sicilian winemaking techniques. The green harvest, the sun, the altitude and the meticulous selection of grapes are matured for three mounths in barriques, giving extra complexity to this wine. 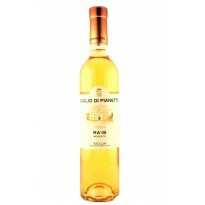 Golden yellow colour, the fragrance is floral with a harmonious and intense aroma of tropical fruits and vanilla. On the palate it is full, rich and soft.